When the Law of Attraction isn't working for you, you may feel disappointed and dissatisfied with life. But because what you think and feel creates, you only end up attracting more disappointment and dissatisfaction. It's like a vicious circle you're caught in, but you want so desperately out of. The Law of Attraction isn't working for you because you're filling your thoughts with things you dislike. You keep feeling unhappy when you look at the things in your life you want to change. You can visualize all you want, create all the lists you want, do every possible Law of Attraction technique you can get your hands on, but if you keep focusing on what is wrong with your life, you're wasting your time! If you keep focusing on not having the relationship you want, you will create more of not having the relationship you want. If you worry about how you're going to pay your mortgage, you will create more experiences of having trouble paying your mortgage. If you fixate on how where you live is too small, too noisy, or what not, then you will create more of those instances. Instead of creating what you want, you will create what you don't want. Whenever you focus on what you dislike about your life, the Law of Attraction isn't working to bring you what you want because you are using it to create what you don't want. That's why the Law of Attraction isn't working for you! Instead, you need to start focusing on the good things in your life, no matter how small they may be. Did a stranger unexpectedly smile at you? Did someone have a kind word for you at work? Did you do something nice for yourself today? Did you get a good parking space? Was something on your shopping list unexpectedly on sale? Did you have a good hair day? Was your dog/cat/child/roommate happy to see you when you got home? No matter how unrelated it might be to what you want to manifest, be grateful for the good things in your life. The more grateful you are for them, the more you create opportunities for other good things to come to you, including the very things you desire most. Decide to find something good in your life. Decide to find as many good things as possible. You'll no longer be able to say the Law of Attraction isn't working for you. Instead, you'll be wondering how great it can be. How Good Are You Willing to Let Your Life Get? What is the Critical Law of Attraction Step? So true and yet it is usually the part that everyone always overlooks. I’ve notice that simply being aware of my thoughts and feelings a few times a day has really made a difference. It took a few days but it just gets better. Next time when an unwanted or negative thought or feeling comes up, try to notice it abd the intensity of it. The more you do that, the less it will bother you. It really will work wonders. Good advice Aaron! Thanks for sharing. I now have a gratitude Jar where I put at least one good thing that happened in my day with the goal of reading them all at the end of the year. I’m not even 3 weeks in and I already realize I’ll need a bigger Jar because some days I write 3 or 4 really good things – it helps put lots in perspective and I have noticed a massive shift in how I manage the more ‘ interesting’ days. Fantastic idea Lyly! I’m so glad it’s working so well for you. Thank you Elizabeth 🙂 it’s a process but I’m getting there. Reread this article and then read what you just wrote. 😉 Combine it with your jar and I think you’ll start to see the progress you want. Elizabeth, Gosh I wish you offered coaching lol! one step at a time 🙂 THANK YOU!!! Could use some comforting advice right now. Well I’ve been trying to attract this girl and haven’t seen her in over a two years. she recently started attending college again and I seen her last week in the business office. it was so strange how it happened and of course I wasn’t expecting it but she was literally standing at the front counter as I walked out of the advisors office. it was just me and her and it happened so quick it took me by surprise. unfortunately I was stupid and looked away as she looked over at me. i know you’ve talked about missed opertunities before but I’m just wondering if I can ever see her again soon (another opportunity)and not in another couple years. I know I know, I should have made some kind of gesture but it caught me off guard so quick I didn’t know what to do. any advice is greatly appreciated. Read the post above. 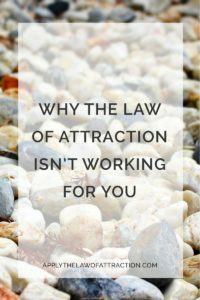 It explains why the law of attraction isn’t working for you. Me and boyfriend broke up like 3 months ago. We haven’t spoke since then. I feel I’ve used the loa but I haven’t heard from him yet. And I get depressed often 🙁 help me. WOW! you all should seriously the number of success stories and positive reviews on Amazon. That right right there should clear up any doubts that anyone would have about the book and LOA. By the way I’ve bought the and it is good. I’ve come a long way since then and still got a few blocks but have definitely made serious strides. Much luck and love to all!!! I’m noticing these thought in my mind… I don’t feel good about myself feeling this way. Sometimes I feel jealous and unhappy of others love around me, how to change that .. I feel this is just a fling, they are not happy together , just trying to showcase their love in public. Other times , I get uncomfortable and feel the other person is needy if they are very affectionate and expressive .. Like, when a friend calls often and checks on me or wanted to hang out with me, I feel very much pressured and feel that person as very needy.. This happens towards little kids as well. Any suggestion to improve my thoughts ? I’m battling to feel positive about these but sometime I get trapped..
Maybe you should spend time with people you actually like. If you don’t want to be around your friends and kids, don’t be around them. It’s ok to be alone.